OK, to be fair, criticizing this sad little example of Inglisc is like shooting fish in a barrel: the site, complete with dancing dolphin icon, looks like it was designed circa 1979. No one’s apparently visited it since. But it’s still an outstanding example of its genre: Garble Translate (a useful tool brought to you by the fine minds at Google). 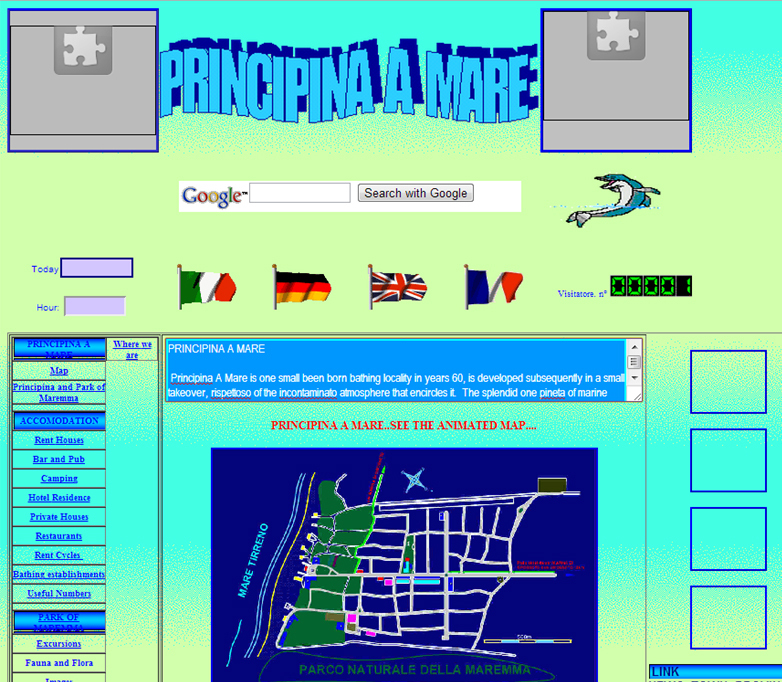 If you want to experience the whole tragic mess, you can visit the Principia A Mare site yourself. The below is just a taste. Meanwhile, doesn’t “one wide sand beach white woman” sound just like a Bob Marley song? Principina A Mare is one small been born bathing locality in years 60, is developed subsequently in a small takeover, rispettoso of the incontaminato atmosphere that encircles it. The splendid one pineta of marine pines, in which Principina a Mare is found, is remained unchanged in the rich time and e’ of fauna and typical flora of the Mediterranean spot. This natural atmosphere, has given origin in years 70 to the creation of the Park of Maremma that extends to long south the coast until Talamone. In proximity of the sea the pineta it leaves space to one wide sand beach white woman, bathed from a crystalline sea, that “Blue Flag” has received from by now 4 years the prestigious European acknowledgment. The geographic position of Principina a Mare, mails to the center of a natural amphitheater, constituted from hills of entroterra the Grossetano, guarantees them particularly favorable climatic conditions, limited precipitations and in the summery period the constant presence of a marine breeze, maintains to gradevole the temperature. Principina a Mare jewel of the Maremmana coast, dates its characteristics e’ the ideal for a vacation imprinted to the well-being and the tranquillity, its receptive structures, hotel, residence, bathing establishments, offer every confort. Possible is the practical one of numerous sports, which swim, sail, windsurf, tennis, minigolf, beach volley, moreover the presence of a dipped ciclabile track in the pineta, allows to connect Principina A Mare with Marina of Grosseto Castiglione della Pescaia and Grosseto. In the pineta of Principina A Mare, they are moreover present areas equipped with games for children and ciclys distances adapted to walks and pauses for pic-NIC. Although its reduced dimensions the tourist offer is varied and concurs one relaxant vacation and the possibilist of the choice on various tipologie of acceptance structures. Night’s passing For the night’s passing has the possibilist to choose between hotel equips you of all the confort, places to little distance from the sea residence, and apartments in rent, offers from the real estate agencies. The beach much width extends to south for approximately 5 km until foce of the Ombrone river, offering a wild landscape and incontaminato, the presence of some natural smalls lake in proximity of to the numerous and rare beach offers shelter to species of aquatic birds us. Given to the amplitude and the extension of the free beach also in the period of maximum summery affluence, it is possible to enjoy one vacation to the standard of the contact with the nature and the maximum peace and tranquillity.